9.28.2017 | 4 p.m. - 7 p.m. Thrive is Kansas City’s premiere celebration of excellence in local community development efforts. Six projects and organizations will be honored and presented awards. Videos, social media, and an interactive environment at the Scottish Rite Temple will bring each nomination to life. As a guests at this event you will have the opportunity to experience locally-sourced food and entertainment. Food and drinks are included in your ticket purchase. 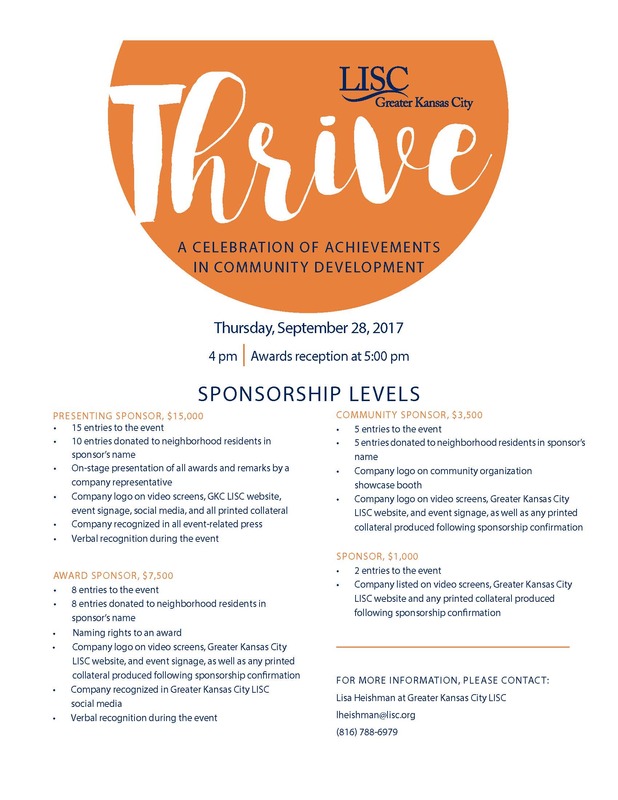 Please join us September 28th at Thrive, Kansas City’s inaugural annual event to celebrate excellence in community development. Meet the 2017 Thrive Honorees! Margaret May has served as executive director of the Ivanhoe Neighborhood Council (INC) for over 15 years. She has provided strong, tireless leadership that built the Council into one of the most recognized and successful neighborhood organizations in Kansas City, including establishing and developing INC as a successful community development corporation (CDC). Steven Curtis is the Director of Community Building & Engagement at Community Housing of Wyandotte County. A longtime resident of the St. Peter's/Waterway neighborhood, Mr. Curtis has worked for the last seven years to lead community improvement and engagement projects throughout the Grandview Corridor, which encompasses several neighborhoods. Since 1973, Westside Housing has worked with residents, local businesses, and key stakeholders to build sustainable communities that are safe, affordable, and healthy places where diverse people want to live, work, and play. The Giving Grove has developed a wholly unique program model to address the complex problem of food security in Kansas City communities by training neighborhood and community leaders as volunteer orchard stewards. The Giving Grove has worked with our community partners to establish 133 orchards across the Kansas City area, with the potential to produce more than 12.6 million pounds of fresh food over the lifetime of these 1,928 trees. The new facility allows the YMCA to serve more people through important programs, such as swim lessons, after-school homework help and mentoring, health screenings, nutrition classes, wellness and fitness programs, community events, and other activities for people of all ages to improve quality of life. The neighborhood has raised nearly $500,000 to build the city's only embankment slide, a playground, basketball and futsal courts and bathrooms. The area went from a space that was used by homeless people to sleep, bathe in the fountain and many illegal activities. There are very few opportunities in the year when representatives from the public, private and philanthropic sectors come together to celebrate neighborhood revitalization. Join us in sponsoring Thrive, Kansas City’s inaugural annual event to celebrate excellence in community development.